Gathering up friends and heading out for a meal is among the most social activities around. 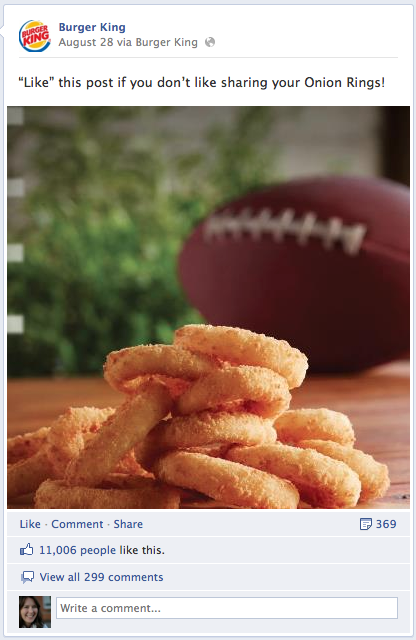 Restaurant marketers are launching innovative campaigns in social media, tying offline love to online engagement. Diners are catching on, too – restaurants are followed on Facebook more than most brands, second to only entertainment companies, according to a May 2012 study by Performics. 1. They’ve tapped their customers in social media to make decisions about their offerings. Who better to help make decisions about the menu than the people who know and love the dishes? For HuHot Mongolian Grill, this happens every year. Its annual “How Do You HuHot? Recipe Contest” asks grill lovers to submit their ideas for recipes for new stir-fry sauces, even down to the sauce name. The contest, in its 5th year, is hosted on a Facebook app and on the HuHot website and was built was Shoutlet’s Social Canvas™ tool. Restaurants can give customers the reins and give them ownership of the places they know, love, and gather through initiatives like this one in social media. 2. They’ve scaled their efforts to engage consistently across all locations. Restaurants with hundreds of in-store locations and social media presences for each are faced with the challenge of offering a coordinated brand experience across all presences, while still keeping the engagement at the local level. Casual dining brand Houlihan’s used Shoutlet to syndicate its Facebook contest to 54 Facebook pages for individual locations last year, resulting in more than 10,000 entries in 30 days. Images have fueled the growth of major sites like Pinterest and Instagram, not mention that they’re being integrated into social media content in a big way. When it comes to food, people can’t resist a picture of a delicious-looking dish. Food pins are the most likely to get repinned on Pinterest, and many a picture of restaurant meals has been uploaded to Foursquare, Yelp, Instagram, Foodspotting, and other apps. Brands like Shoutlet customers BurgerKing and Smashburger take advantage of the tendency to suddenly get hungry at the sight of crispy fries and a cold beer. Combine that with things like sharing options and Like buttons, and fans are able to respond in an instant. 4. They’re providing prompt and helpful social customer service. 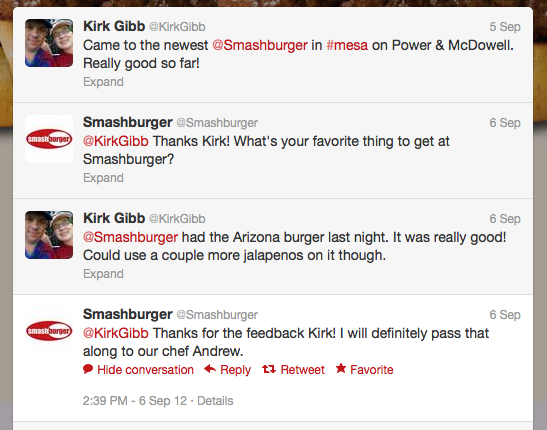 For the burger gurus at Smashburger, prompt and helpful responses to questions and comments are part of its social outreach. For brands that are quick to respond, it pays off: 64% of Twitter users are more likely to make a purchase from a brand that responded to them, according to InboxIQ. And if they have a complaint, the impact of responding is even bigger. More than 80% of people who’ve tweeted a complaint on Twitter and received a response from a company said they “loved” or “liked” it, with 74% of them saying they were satisfied with the response. 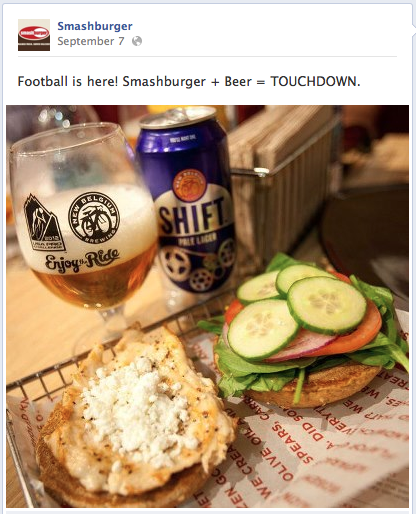 How have you seen your favorite restaurants use social media? Video is becoming increasingly important to restaurants and other SMBs. vADz(TM) VideoCoupons & VideoAds (www.vADz.com) enable independents to quickly and economically create their own VideoAds featuring specials, pairings, gift cards and coupons. Video creates 2X to 3X higher engagement over print and still images. vADz makes it easy. Shoutlet provides enterprise social marketing software for companies to engage consumers online and monetize their social media communication. It includes Facebook, Twitter, and YouTube management, Social CRM, a contest platform, HTML5 web app building, mobile marketing, social commerce, and real-time analytics in one easy-to-use interface.